It was a honor to be a part of the latest issue "Rice" @peddlerjournal. Thank you so much for sharing my rice stories and my grandma's stories. It deeply moves our hearts, especially the chapter "Grandma's wisdom" which is beautifully described and illustrated. My grandma was holding the journal and saying "It is wonderful to have a written record because my memories are not so good any more" She was proud what we have done together and I am so happy of who inspired me to pursue my small project. Please check Peddler Journal and get inspired all the beautiful stories. Rice is transparent whereas glutinous, or sweet rice is opaque. Rice starch is mainly composed of amylose and amylopectin. Sweet rice is composed of nearly pure amylopectin. This characteristic makes it very viscous and useful as a superior thickening agent by inhibiting liquid separation. "Having observed that the consumption of rice in this country, and particularly in this Capital was very great, I thought it my duty to inform myself from what markets they draw their supplies, in what proportion from ours, and whether it might not be practicable to increase that proportion. This city being little concerned in foreign commerce, it is difficult to obtain information on particular branches of it in the detail. I addressed myself to the retailers of rice, and from them received a mixture of truth and error, which I was unable to sift apart in the first moment. Continuing however my enquiries, they produced at length this result; that the dealers here were in the habit of selling two qualities of rice, that of Carolina, with which they were supplied chiefly from England, and that of Piedmont; that the Carolina rice was long, slender, white and transparent, answers well when prepared with milk, sugar &c. but not so well when prepared au gras; that that of Piedmont was shorter, thicker, and less white, but that it preserved it’s form better when dressed au gras, was better tasted, and therefore preferred by good judges for those purposes; that the consumption of rice in this form was much the most considerable, but that the superior beauty of the Carolina rice, seducing the eye of those purchasers who are attached to appearances, the demand for it was upon the whole as great as for that of Piedmont." There are 3 basic sizes of rice, long-grain, medium and short-grain. The size of the rice determines the cooking texture and flavor. Each rice can be used for specific dishes and recipes. Long-grain rice is fluffy when cooked, so it tends to separate. The grains have a firm, dry texture, and are best for side dishes, pilafs, stir-fry and salads. Long-grain rice is also slim and lengthy, nearly four to five times longer than it is wide. This type of rice includes American long-grain white and brown rice, Basmati rice, and Jasmine rice. Medium-grain rice is tender, moist, and stickier than long-grain rice when cooked. Shorter and wider than its long-grain counterpart, medium-grain rice is about two to three times longer than it is wide. Arborio and Valencia are medium-grain varieties used in Italian risotto. The Spanish varieties of Arroz Negroni and Bomba rice are used in paella. Short-grain rice is the most sticky and soft when cooked. This fat, and round grain has an extra starch which gives it its sticky and clumpy texture. American short-grain brown rice and sushi rice are common varieties of short-grain rice. Short-grain rice is perfect for sushi and pudding. Fiera del riso (Rice Fair) is the second biggest festival in Europe after the October Fest. This is the 50th anniversary which has been growing the tremendous numbers of visitors each year. It brought a half million visitors during the festival 2015. 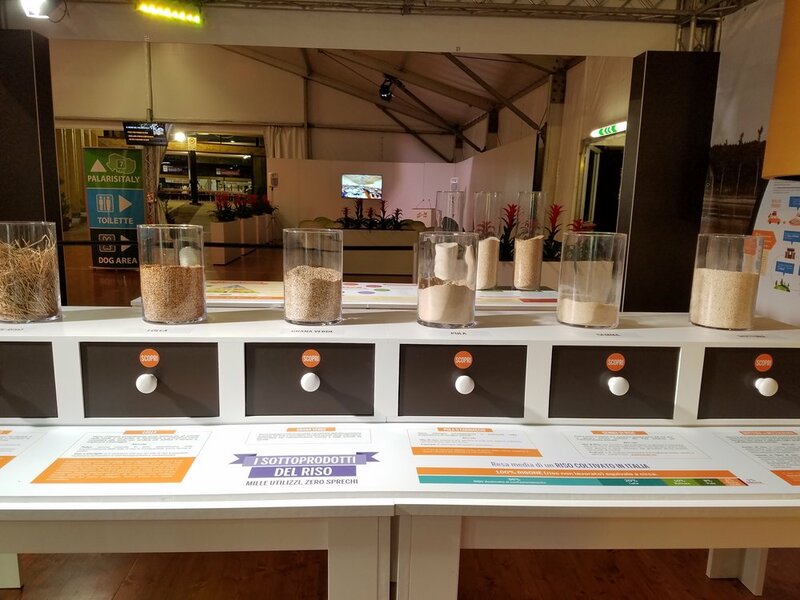 Two indoors spaces featuring different local restaurateurs hold over 12,000 visitors who choose between many different risottos, rice deserts, rice pizzas and drinks. The outdoor area was full of vendors from all across Italy. Culinary competitions encourage farms, restaurants and public in daily programs. A new additional venue in this year is Rice exhibition "Oryza" which curated by Davide Mantovani. 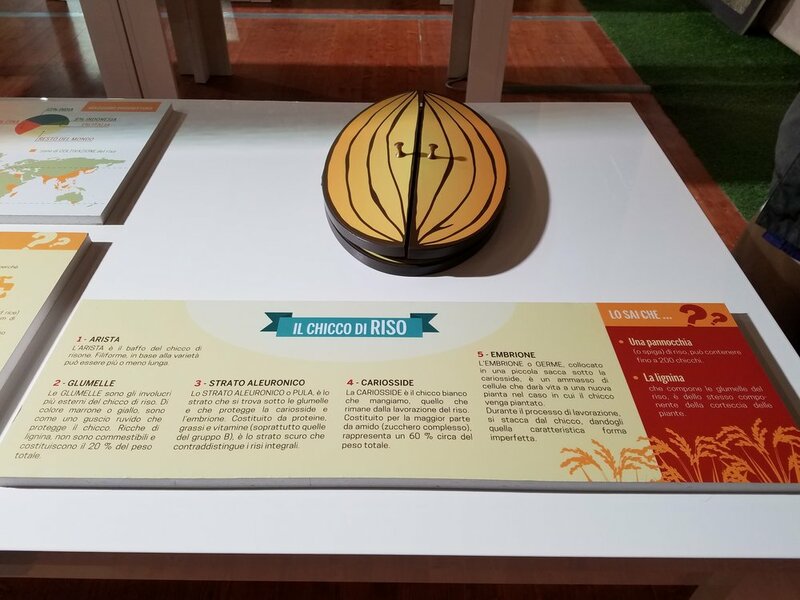 It was an incredible display educating people about rice in its cultivation, culture and history. 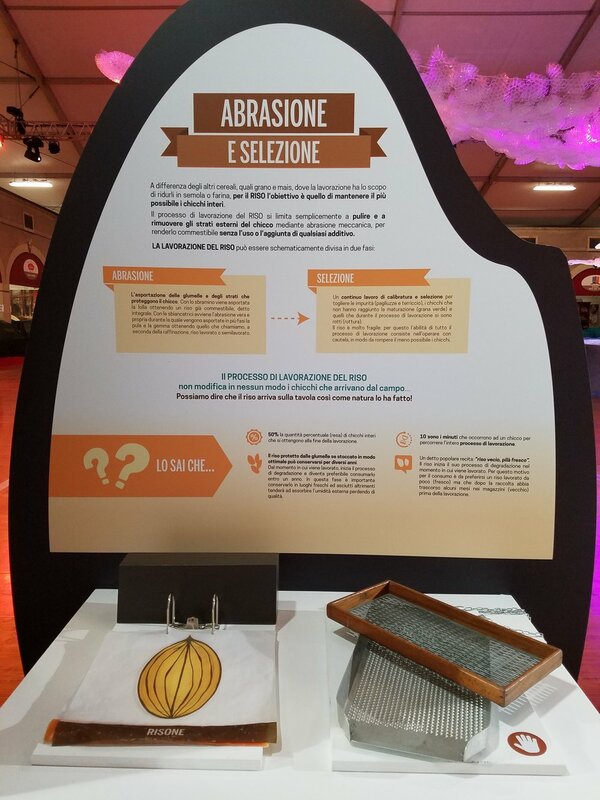 This is great a showcase to share rice knowledge which should be continued and treasured. Great job Davide and his friends! 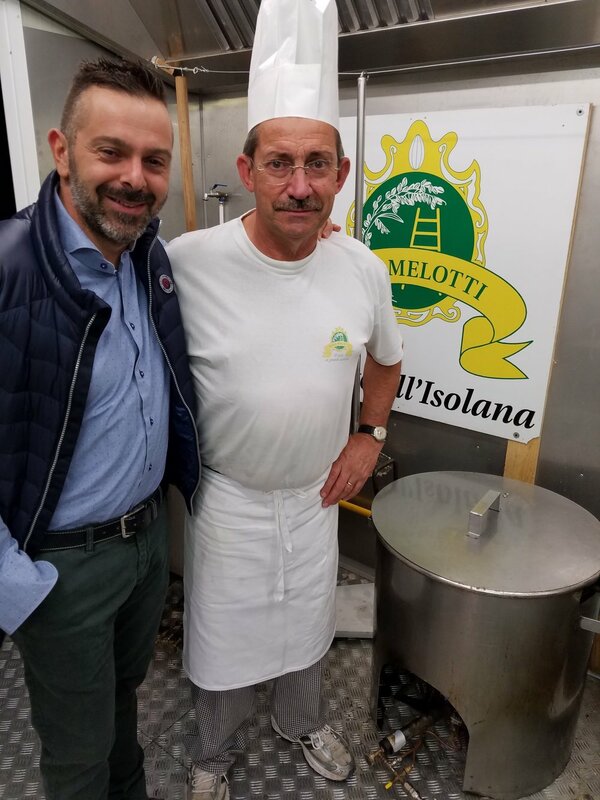 Melotti Farm/restaurant usually serves 65,000 risotto bowls during the festival. 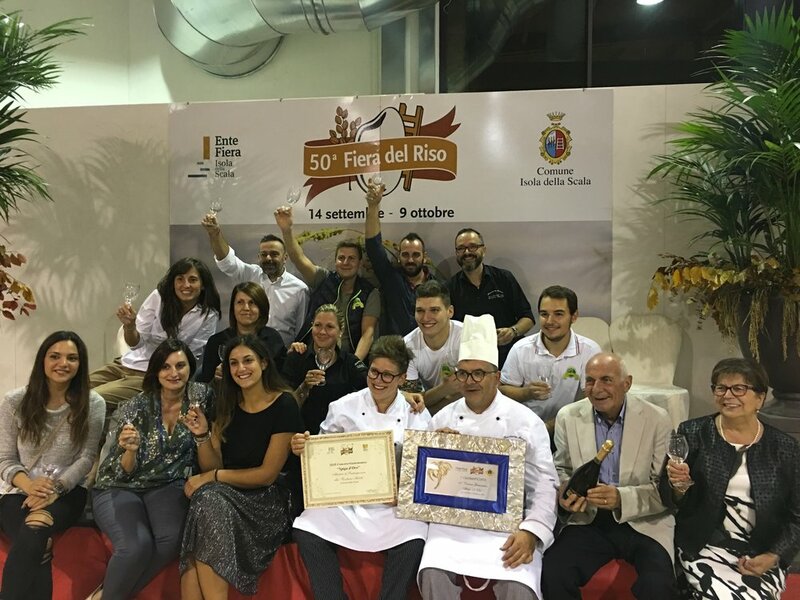 Melotti Risotteria restaurant won the competition making the traditional local risotto. Rice-fish farm is the environmentally friendly best practices. Releasing fish in the created extensive artificial wetlands (rice paddies) helps insect control and creates the ecosystem. Rice plants also provided shade, thus keeping the water cool and allowing fish to remain active even during the hottest months. Did you know fish poop is the primary source of Nitrogen in any aquaponic system? Duckweeds could be a rice companion plant! What the duckweeds do. They clean the water, provide bio-fertilizer, allege control, and limit mosquitoes. These are things that humans are not able to control without adding chemicals. Also, duckweeds contain high amounts of protein, more so than soy bean. Duckweeds are a good food resource in some parts of Asia for both animals and humans. Duckweeds spread quick, colonies of them could cause a problem of oxygen. But, don’t worry, other good friends working together in the water. In Korea, we call Keguri Bap (duckweeds), means 'Bullfrog’s rice'. A lot of time bullfrogs live in the rice paddies. The duckweeds are extremely dense on the surface of the water that when they swim out of the water, their face is covered with duckweeds. So, it looks like bullfrogs are eating the duckweeds. That’s how we named it? In Korea, while the little children are eating rice and if they leave some rice on their face, the parents say ” You have bullfrog’s rice on your face”. I love the sound of word 'Keguri Bap'. People often ask; what is the difference between white rice and brown rice? They both come from the same rice grain or plant. The main difference between the two forms of rice is in the milling process. This process affects the color and nutritional content of the rice. When only the hull, or outermost layer of a grain of rice is removed, the result is brown rice. When the next layers are removed, the bran layer and the germ, leaving the starchy endosperm, white rice is produced. Brown rice and white rice have similar amounts of calories and carbohydrates. However, brown rice contains more iron and fiber. Brown rice usually has a nuttier flavor and chewiness compared to white rice and requires a longer cooking time.